Stanley Kubrick’s 2001: A SPACE ODYSSEY first premiered in the U.S. on April 2, 1968. As the visual masterpiece turns 48 this week, read an essay penned by science writer Isaac Asimov about the film for a 1977 issue of American Film. Science fiction, at least in the world of film, had, ever since the ’30s, established itself as youngster-oriented. It was cops and robbers, good guys and bad guys, white hats and black hats. It was stylized as the youngster-oriented Western. Change the keen-eyed, rangy cowboy on his cayuse, to the keen-eyed rangy astronaut at his controls; the schoolmarm into the scientist’s daughter, the shifty-eyed rustler into the shifty-eyed Martian; and you’ve got it. 2001: A SPACE ODYSSEY (like DESTINATION: MOON before it) was, however, in the hands of a crackerjack scientist/science fiction writer — Arthur C. Clarke. That meant 2001: A SPACE ODYSSEY could be relied on to have the elementary facts of science straight. Spaceships would look like spaceships, and the moon would resemble our satellite. Stanley Kubrick spared no expense on special effects in 2001 and for that reason it made movie history as the first hit adult-science-fiction film. 2001: A SPACE ODYSSEY was not to be surpassed in sheer popularity within the genre until the coming of STAR WARS. 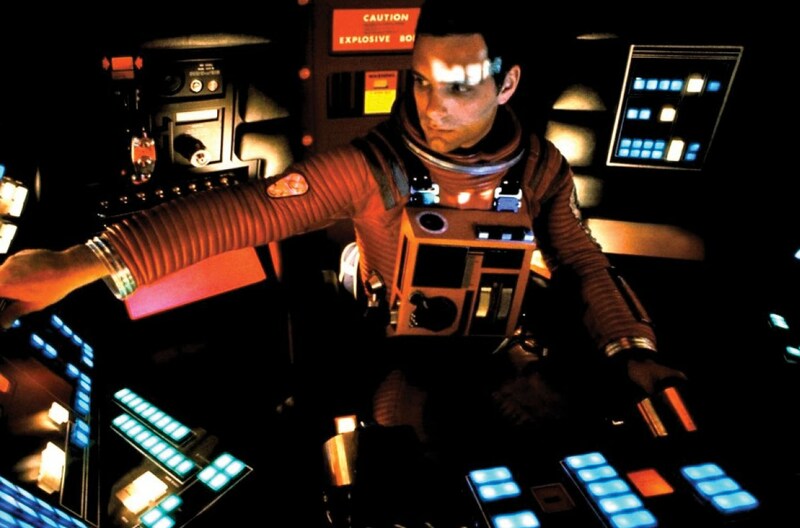 What is, by all the odds, most remarkable about 2001: A SPACE ODYSSEY are its visual effects. These do not achieve their interest through the display of extraterrestrials, but through the depiction of those sights of outer space which are there and can be seen in reality. 2001: A SPACE ODYSSEY shows a world that does not yet exist and shows it not as it might be, but almost certainly as it will be, and that is unique. In fact, when the time comes that we are sufficiently at home in near space to take the kind of motion pictures in reality that 2001 took by means of ingenious special effects, I am quite certain the real will turn out to be just like the fictional, but inferior. People will turn to 2001: A SPACE ODYSSEY to see space at its most beautiful. It was,it still is,and it always will be THE GRAND MASTERPIECE OF ALL TIME OF ALL SCIENCE FICTION FILMS.